PESHAWAR, Pakistan, Jan 1 2015 (IPS) - They number between two and three million; some have lived in makeshift shelters for just a few months, while others have roots that stretch much further back into history. Most fled to escape war, others simply ran away from joblessness. Whatever their reasons for being here, Afghan refugees in Pakistan all now face a similar plight: of being caught up in the dragnet that is sweeping through the country with the stated goal of removing ‘illegal’ residents from this South Asian nation of 180 million people. According to the United Nations Refugee Agency (UNHCR), some 1.6 million Afghans are legally residing in Pakistan, having been granted proof of registration (PoR) by the U.N. body. Twice that number is believed to be unlawfully dwelling here, primarily in the northern, tribal belt that borders Afghanistan. Most arrived during the Soviet invasion of 1979, the chaos of war squeezing millions of Afghans out of their embattled nation and over the mountainous border that stretches for some 2,700 km along rocky terrain. The Federally Administered Tribal Areas (FATA) and what was then known as the North-West Frontier Province, now called Khyber Pakhtunkhwa (KP), offered an easy point of assimilation, the shared language of Pashto bridging the divide between ethnic Pashtun Afghans and the majority Punjabi population. But what began as a warm welcome has turned progressively sour over the decades, as Afghans are increasingly blamed for rising crime, unemployment and persistent militancy in the region. The Dec. 16 terrorist attack on a school in the KP’s capital Peshawar – which killed 132 children – has only added fuel to a fiery debate on the status of Afghan refugees, who are accused of swelling the ranks of the Pakistani Taliban and affiliated militant groups operating with impunity in the tribal areas. Three days after the massacre, on Dec. 19, KP Chief Minister Pervez Khattak convened an emergency cabinet meeting to demand the immediate removal of all Afghan refugees, claiming that the grisly attack on the Army Public School was planned in Afghanistan. His call for repatriation joined a chorus that has been growing steadily louder in northern Pakistan as the average citizen struggles to come to terms with an era of terrorism that has resulted in over 50,000 deaths since 2001, when the U.S. occupation of Afghanistan prompted a second wave of immigration into Pakistan. A heated national debate eventually resulted in a decision to allow lawful Afghan residents to remain in the country until the end of 2015, at which point plans would be made for their safe return. A previous plan, which followed on the heels of a Peshawar High Court order to repatriate Afghan refugees by the end of 2013, did not see the light of day, largely as it would have entailed over a billion dollars in international assistance. Tired of waiting for government action, however, local authorities have taken the law into their own hands by embarking on a major crackdown on Afghan refugees. “About 80 percent of crimes in KP are committed by Afghans,” alleged KP Information Minister Mushtaq Ghani. “They are involved in murders and kidnapping for ransom, but they disappear after committing these crimes and we cannot trace them,” he told IPS. “Therefore we demand that those having PoR be restricted to camps, and those without [their papers] sent home,” added the official, whose province is home to an estimated one million Afghans. Police Officer Khalid Khan says his force is arresting roughly 100 people each day. “Every house is searched,” he told IPS, adding that even those who live in “posh localities” are being investigated as possible unlawful residents. Terror and crime are not the only problems for which Afghans are being blamed. Trade and industry experts here claim that illegal ventures established by refugee communities have destroyed local businesses. 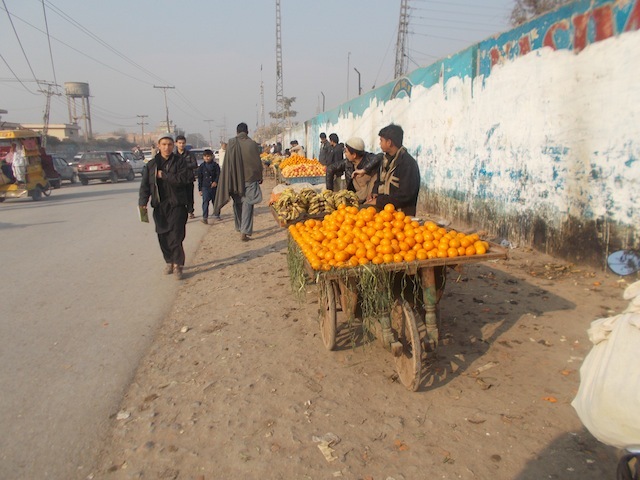 According to Ghulam Nabi, vice president of the KP Chamber of Commerce and Industries, Afghans run 10,000 of the estimated 20,000 shops in Peshawar; but since they are not registered residents, they are not subject to the same taxes as Pakistani shop-owners. He told IPS his department has been “urging” the federal government to repatriate Afghans so locals can continue to do their trade. He also alleged that refugees’ demand for housing has pushed rents to unaffordable prices. Besides hosting hundreds of thousands of Afghan refugees, the KP is also saddled with scores of displaced Pakistanis, the most recent influx arriving in the midst of a government military campaign in North Waziristan Agency aimed at rooting out insurgents from their stronghold. 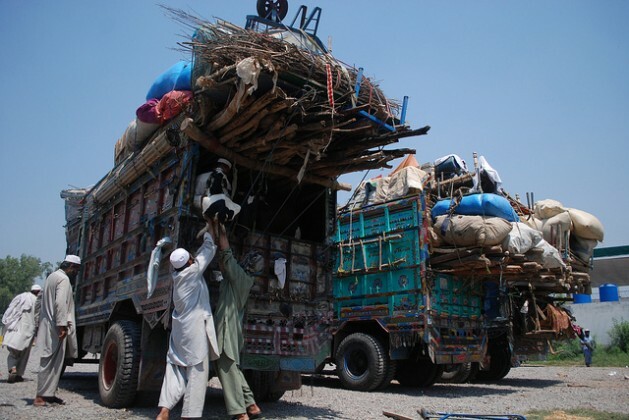 Abdullah Khan, a professor at the University of Peshawar, told IPS that two million displaced Pakistanis from adjacent provinces are now residing in KP, many of them in makeshift ‘tent cities’ erected in the Bannu district. According to Khan, Afghanistan’s gradual return to democracy has paved the way for safe return for refugees. He, along with other experts and officials, see no further reason for Pakistan to continue to host such a massive international population within its borders – especially with so many domestic issues clamouring to be dealt with. Former cricket legend Imran Khan, whose Pakistan Tehreek-e Insaf (Pakistan Movement for Justice) party rules the KP province, has also echoed the demand. “The government issues 500 Pakistani visas to Afghans at the Torkham border [a major crossing point connecting Afghanistan’s Nangarhar province with FATA] everyday but an estimated 15,000 to 20,000 people cross the border daily,” he said on Dec. 18. “The illegal movement takes place because we don’t have a system to track these people and their activities here,” he added. In a bid to rectify gaps in the system, police in KP are now blocking cell phones belonging to Afghans and taking steps to regulate the movements of refugees who may be in violation of their visa status. But many Afghan residents claim the allegations are unfounded, while those who have lived here for generations consider Pakistan their home. Others are simply afraid of what will be waiting for them if they do go back. Gul Jamal, an Afghan elder, told IPS that while his family was eager to return, the situation back home was “extremely precarious”. “There are no education or health facilities, and no electricity,” he claimed, adding that job opportunities too are few and far between in Afghanistan. He hopes the Pakistan government will “take pity” on his people. “Forced repatriation will expose us to many problems,” he explained. In an interview with IPS on Dec. 22, Federal Minister for States and Frontier Regions Abdul Qadir Baloch categorically stated that legal refugees would stay on until the end of 2015 as per the government’s agreement with UNHCR. “The registered Afghan refugees have never been found to be involved in terrorism-related incidents in the country and they won’t be sent back against their will,” Baloch stressed. “The government will protect legal Afghan [immigrants] against forced repatriation,” he asserted.